Before there was the North Capital (Bei Jing) there was Chang’an, the city of Perpetual Peace, which is now called Xi’an, Western Peace. Ten ancient Chinese dynasties had their capital in Chang’an, including the Qin Dynasty, which represents one of the most interesting and tumultuous periods in the city’s history and the start of the Chinese Empire. The first emperor of Qin, Qin Shi Huang (Ying Zheng), ruled the unified kingdoms of China between 221 and 210 BC. Before that he was a ruler of the Kingdom of Qin and the warlord who conquered six other kingdoms in order to create a unified China that lasted for about 2000 years. Besides being a brilliant and ruthless general and something of an innovator and visionary, he was incredibly paranoid. During his reign he decided that the new empire needed to be better protected, mainly from attacks from the north. So, he began a bold and ambitious project of connecting the remaining fortification walls of the kingdoms he had conquered. That was the start of the Great Wall of China. He also realized that he had been responsible for much death and suffering in his quest to create a strong Chinese Empire. In fact, it occurred to him that there were many more enemies of his “on the other side” than remained alive. The ones who had been dispatched to the world beyond were undoubtedly waiting to take revenge on him. He needed protection of his army. Even though he had lost a great number of his soldiers it was not enough to defend him. The story goes that as he was building his tomb on the outskirts of Chang’an (Xi’an) it occurred to him that he could take his best and bravest warriors with him to the other side. He ordered his adviser to pick several thousand of his best soldiers and bring them to the capital for his approval. The ones that made the cut would be killed and buried along with their armor, weapons, and horses (if they had them) in formation in the king’s tomb. That way they would be ready to defend the emperor once he crossed over. The adviser was horrified and tried to talk the insane emperor out of it, but only incurred his wrath and was ordered to assemble the soldiers under penalty of death. So, he began selecting the soldiers, as ordered, meanwhile thinking of a way to save their lives and appease the emperor. 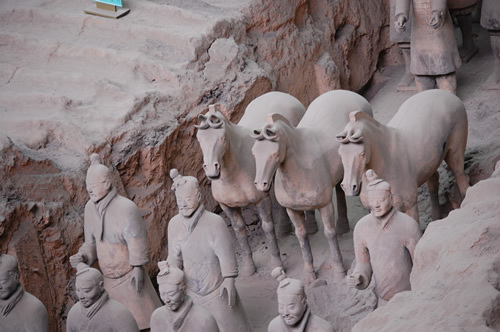 He finally came up with an ingenious plan: order the best and most skilled artisans to create perfect clay replicas of the soldiers, armor, weapons, and horses, and place them in formation at the tomb. At first, Qin Shi Huang was beside himself with anger and wanted to execute the adviser. But Li Si had been his adviser for many years and was able to persuade him. He explained that the human bodies of the soldiers were weak and would wither away over the years, meaning that they would not be able to defend the emperor effectively should his foes choose to attack him. On the other hand soldiers made out burned clay would last for many centuries and would be tougher and stronger than real soldiers. All the emperor had to do was call on them in the night and their souls would be confused and would enter the terracotta bodies instead of their real bodies. 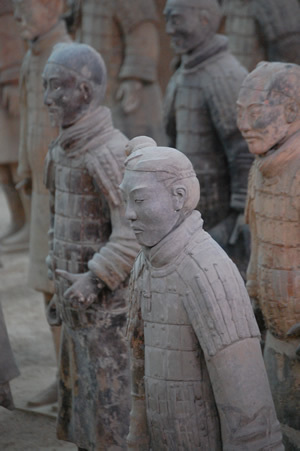 It took hundreds of craftsmen many years to construct perfect replicas of the soldiers. To this day we don’t know how many there are. 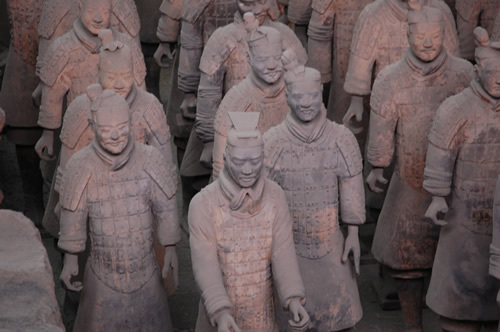 The Terracotta Army museum of Xi’an is one of the most wondrous places in all the world. More soldiers and equipment are still being unearthed at this active archeological site where visitors are allowed a glimpse of the process of uncovering and repairing the soldiers and their horses and equipment. 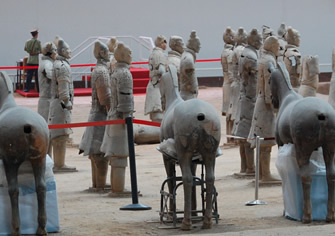 There are about 8,000 unearthed terracotta soldiers in three pits, armed and ready for battle. They are an awesome sight, each unique and very lifelike. In fact they look so real that an occasional shiver might travel down your spine as you walk around the giant pits and inhale the aroma of ancient clay. It’s really miraculous to see that many statues of different people constructed with such an amazing attention to detail that you can’t help but watch for movement out of the corner of your eye. If you know anything about ancient Chinese military history you can spot soldiers of different ranks and units. There are archers, charioteers, infantry, even the rear guard, standing at full attention ready to be called upon. 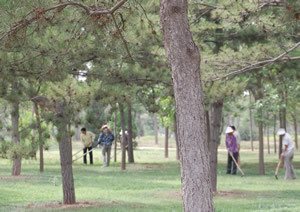 The museum itself stands on a very large property surrounded by pine groves and picturesque gardens. It’s a spacious and peaceful place kept immaculate by the ubiquitous groundskeepers and janitors. There are also two shops that offer official Terracotta Army related merchandise as well as crafts sold by merchants who lease their stalls from the museum. You can even buy a life-sized replica of a general to guard your house. Anything and everything is for sale here except the relics themselves which are closely guarded even against flash photography by the stone-faced young men in uniform. Soldiers guarding soldiers. Qin Shi Huang would certainly approve. This entry was posted on Monday, October 20th, 2008 at 7:50 pm	and is filed under Geotagged, History, Must See Geography, Politics & Borders, travel. You can follow any responses to this entry through the RSS 2.0 feed. You can skip to the end and leave a response. Pinging is currently not allowed. I was lucky enough to get to see this in the late 80′s as a teenager traveling with my grandparents in China. I am still not able to describe to people how massive and awe inspiring it is. There are also some great peices outside as well on the raod up to the main part,mostly animlas, but again very life like and detailed. I will dig my old pictures out to see if I have anything differnet than what is posted here. If anyone ever has a chance to visit this place-DO IT! I have a small terracotta soldier on my desk that watches over me all the time. I bought him from a vendor outside the museum. I would love to go back one day. Thanks for sharing!